Chocolate Caramel Bars For Valentines Day - Yum! It's Valentine's Day this weekend and I've got a recipe for you that would make an ideal treat for someone you love. What is better than chocolate and caramel? Not much in my book! I got this Valentines dessert idea from Emily, a young Aussie friend of mine, and I just had to pass it on. Now is the perfect time for you to give this goodie a try. 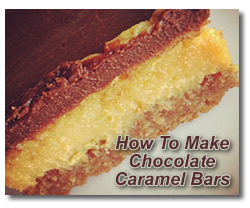 You can read the full story about how I first tried Emily's chocolate caramel slice as well as get the easy to follow step-by-step instructions on how to make your own. You can thank me later! What are you getting or giving for Valentine's Day this year? My best friend bought me a Pandora bracelet for Christmas and hubby is getting me this Pandora 790361 Teacup & Saucer Charm to start off my collection. Aren't I a lucky girl? :) Of course, it makes life easier for him, too! I enjoy making my hubby something special for Valentine's Day, but if you don't plan to make a sweet treat for your Sweetheart this year, there are always great gift ideas for you to choose from. I've got a huge selection for you to browse, but I can tell you right now that if you really want to impress, you won't do better than a gift from zChocolat . Believe me, I've personally tried the gourmet offerings from zChocolat and they knock your socks off! You simply can't go wrong! Whatever gift giving path you take, homemade or store-bought, I'd like to wish you and yours a romantic and memorable Valentine's Day. Thanks for being one of my sweet chocolate loving friends! As always, I'd also really like to see YOUR creations. Be sure to include your photos and tell your story here. They'll all be added to the website for everyone else to enjoy, too. I hope you enjoyed this issue of Charmingly Chocolate. If you have any feedback or comments you'd like to share with me, just reply to this zine and let me know. And don't forget to check out our Chocolate Candy Mall Store. Buy some homemade goodies, or list your own for sale!